Customers are slipping through your fingers. You know you’ve built a great product or service, and traffic looks good, but… something isn’t working. If only you could pinpoint the problem. What a pity if the answers are within reach but you can’t grab hold of them in time. WebEngage prevents this nightmare from playing out and allows web-based businesses to take full control of customer engagement. 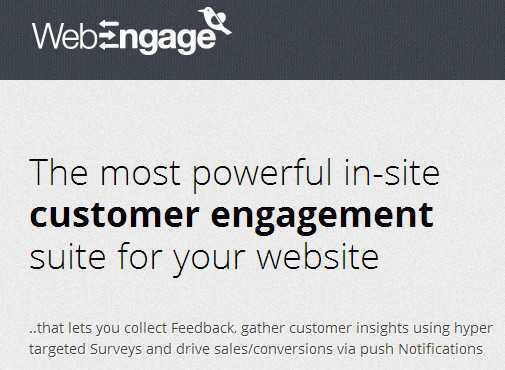 WebEngage is an in-site suite of customer engagement tools. Three key features – Notifications, Surveys, and Feedback – improve customer engagement and gather precise information. Customized targeting lets companies execute more successful marketing and promotional campaigns. WebEngage also helps web businesses identify trouble and address visitor concerns quickly. WebEngage eliminates guesswork when it comes to users’ thinking and creates efficient channels for interacting. Here’s a more in-depth look at how it works. In addition to surveys and notifications targeted at particular audiences, WebEngage recently added the ability to run application specific campaigns and promotions. If you’re an e-commerce site and it looks like a customer’s items have been sitting in a cart and will likely go unpurchased, through WebEngage you might offer discounts based on the number of items in a cart or cart value. Web owners now have the flexibility to address situations as they arise. Show appreciation to returning Gold customers with hyper-targeted thank you messages, offer cyber happy hours to enliven periods of quiet traffic, and more. Targeted surveys simply make it easy for visitors to contact you or to find out what you need to know. Build surveys using easy drag and drop tools. Ask one question, or as many as you need. Further ensure that you gather the most valuable information by targeting visitors according to geographic location, URL patterns, time spent on site and more. Filtered questionnaires help generate reports that are useful instantly. Feedback, that vital element of communication, usually translates into better relations and higher profits. Use WebEngage to embed customized forms or a feedback tab on-site. Encourage visitors to let you know how to better meet their expectations and improve service. Manage feedback and replies from a simple dashboard. A screen grab lets users quickly illustrate the points they want to get across even faster. WebEngage is easy to install. After the initial setup, no extra coding is required. WebEngage works on any platform, and turns collected information into actionable analytic reports. All plans come with a 14 day free trial, and WebEngage functions in 25 languages. Check out plans and pricing here. CEO Avlesh Singh and co-founder Ankit Utreja had one word for all the skeptics that said their lack of sales experience would be their downfall: engineering. Confident that friendly human support and building a superior product would set them apart, the duo has bootstrapped from a word-of-mouth venture to earning nearly 6,000 international clients and two rounds of funding (lead by GTI Capital, Indian Angel Network, Blume Ventures, and more angels). Based in Mumbai, WebEngage is a subsidiary of Webklipper. 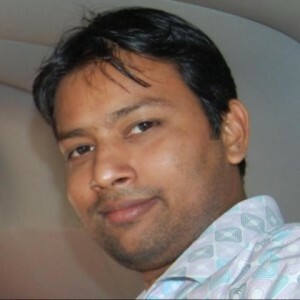 The product first mentality hasn’t kept Singh from learning how to pitch WebEngage expertly. A rather brilliant page explains the benefits of WebEngage through the eyes of developers, product managers, marketers, and sales managers. There’s something to love for everyone. To find out how WebEngage might best work for you or your supervisors, visit here.